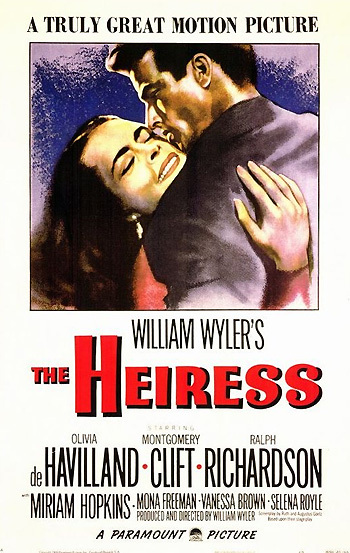 The Heiress (1949), as the theatrical poster declared, is "a truly great motion picture" - a bleak tale of crushed, heartbroken expectations and incisively-harsh retribution. The top-line, prestige production was directed by William Wyler, a master of romantic period dramas, who had already brought bona-fide classics of literature and the stage to the screen, including Dodsworth (1936), Jezebel (1938), Wuthering Heights (1939), The Letter (1940), The Little Foxes (1941), and Mrs. Miniver (1942). The story was "suggested" by Henry James' 1880 novella Washington Square, originally published as a "tragicomedy" serial in Cornhill Magazine (in various installments from June to November of 1880) and Harper's New Monthly Magazine. Harper & Brothers then published the first book edition in December of 1880. In 1947, playwrights Ruth and Augustus Goetz adapted the novella into a play (with a few modifications from the novella, making it more upbeat with a happy romantic ending), titled Washington Square. However, after a failed, theatrical trial run in Boston with the changed version, the Goetzes rewrote the play, restored the original downbeat ending, and prepared it for a Broadway run. It premiered in the fall of 1947 in New York, with the name The Heiress. The 1947 Broadway stage play featured British actress Wendy Hiller as the title character, opposite Basil Rathbone (famous for his Sherlock Holmes role) who won a Tony Award as Best Actor in 1948 for his portrayal of Dr. Sloper. [Note: Ralph Richardson (who reprised his role in the film) starred in the London production as the heiress' father, opposite Peggy Ashcroft.] Actress Olivia de Havilland, who had seen the Broadway play, approached Wyler to also see the play, and urged him to adapt it for a screen version that would feature her in the lead role. William Wyler bought the film rights in 1948 and enlisted the Goetzes to aid in the screen adaptation. Both the play and film were true to the novel. The theme was the age-old conflict between love and money (represented by social class). It featured an icy and haunting musical score from Aaron Copland, and costumes by Edith Head. Almost the entire historical melodrama took place on set in the austere Washington Square Victorian house (in New York's Greenwich Village), reflecting the film's roots on the stage. In the story set in mid-19th century New York City, the 'heiress' was a plain, repressed, shy and virginal Catherine Sloper (Olivia de Havilland). She was the only child and daughter of a wealthy, arrogant, imperiously abusive, and domineering patriarchal physician Dr. Austin Sloper (Ralph Richardson), a widower who idealized his dead wife. Catherine had become a spinster after her young, first love toward a handsome, but penniless, mysterious suitor and mercenary, scheming fortune hunter Morris Townsend (Montgomery Clift) had been thwarted by her stern, tyrannically-selfish father. She stood up against her father for the first time and planned to elope (although much of her dowry-inheritance was threatened to be taken away), but then she was pitifully jilted by the spooked Townsend who mysteriously disappeared. Over many years after her tyrannical father died and she had inherited her father's entire fortune, her anger was suppressed and simmering. It surfaced when insincere, ill-fated scoundrel Townsend returned and again asked for Catherine's hand in marriage. He excused his earlier flight, explaining that he left because he didn't want to cause Catherine to become disinherited. With rational, cold, controlled rage, she turned the tables on him in the final, chilling scene (set on a staircase): "He has grown greedier with the years. The first time, he only wanted my money. Now he wants my love, too. Well, he came to the wrong house, and he came twice. I shall see that he never comes a third time." She realized that neither of the two dominant males in her life had ever loved her, but had only cruelly dominated over her: "Yes, I can be very cruel. I have been taught by masters." The masterful performance by Olivia de Havilland was universally lauded, for its transformative qualities, and for the spine-chilling coldness, hardness and strength she exhibited after being cruelly manipulated by a gold-digger suitor. It had been a great decade for the film's main star, Olivia de Havilland, who had already starred in Gone With the Wind (1939) (with her first Oscar nomination for Best Supporting Actress, which she lost to Hattie McDaniel), Hold Back the Dawn (1941) (with her second Oscar nomination and first for Best Actress, which she lost to her sister Joan Fontaine for Suspicion (1941)), They Died With Their Boots On (1941), To Each His Own (1946) (with her second Best Actress nomination and first win), The Dark Mirror (1946), and The Snake Pit (1948) (with her third Best Actress nomination, which she lost to Jane Wyman in Johnny Belinda (1948)). She finally won the Best Actress Oscar for the second time for The Heiress (1949) - it was her fifth and final Academy Award career nomination. Her gathering strength as a woman mirrored the social milieu in which the film was shown - the post WWII era when women were assuming stronger positions in US society. The work of Sir Ralph Richardson (in his first Hollywood role) as her father was also praised, but Montgomery Clift (in only his third screen role after The Search (1948) and Red River (1948)) seemed mis-cast and stiff, although some of it worked to his benefit as the conniving and insincere suitor. Suspense was created during earlier parts of the film over the question - was Clift's character actually a fortune hunter or not? It was reported that Clift was unhappy with his own performance (he claimed he was better as a more contemporary male romantic lead) both during the film's making and afterwards when it premiered. To everyone's surprise, the studio was besieged by letters from outraged patrons (mostly Clift fans) who complained that the film didn't have a happy ending for the two lovers. The highly-praised film, although not a box-office success, was nominated for eight Academy Awards, including Best Picture, Best Director, Best Supporting Actor (Ralph Richardson), and Best B/W Cinematography, and won four Oscars: Best Actress (Olivia de Havilland, with her second Best Actress Oscar), Best B/W Art Direction/Set Decoration, Best Dramatic Score, and Best B/W Costume Design. De Havilland also won the Golden Globes Award for Best Motion Picture Actress. In 1954, NBC-TV aired a version of The Heiress for season 5 of the Lux Video Theatre, starring Vincent Price (as Dr. Sloper), Marilyn Erskine (as Catherine), Donald Murphy (as Townsend) and Ellen Corby (as Catherine's widowed Aunt Lavinia). And in 1961, a version based on the play was televised on CBS for Family Classics, and starred Julie Harris and Farley Granger. The story was remade and refilmed as Washington Square (1997) with a more contemporary feminist outlook by director Agnieszka Holland, starring Albert Finney as Dr. Sloper, Ben Chaplin as Morris Townsend, Jennifer Jason Leigh as Catherine, and Maggie Smith as Lavinia. There were two notable Broadway revivals of The Heiress, first in 1995, with Cherry Jones as Catherine, Tony-winner Philip Bosco as Dr. Sloper, Frances Sternhagen as Catherine's Aunt Lavinia and Jon Tenney as Townsend. The play won four Tonys, including Best Revival of a Play, and Best Actress (in a Play) for Cherry Jones. The second revival was in 2012, with an all-star cast, including Jessica Chastain as Catherine and Dan Stevens (from Downton Abbey) as Townsend (both with their Broadway debut performances), David Strathairn as Catherine's stern father, and two-time Tony winner Judith Ivey as the busybody Aunt Lavinia. After the simple titles are displayed over embroidered samplers, the setting is "A Hundred Years Ago..." (1849) in New York's Washington Square (in Manhattan's neighborhood of Greenwich Village), with cobblestone streets and rows of homes surrounding a rectangular park area - the parade grounds. At #16, the elegant, lavishly-furnished three-story townhome of Dr. A Sloper, a package with a new dress is delivered for daughter Catherine Sloper (Olivia de Havilland), approximately in her 30s. Coming down the stairs to accept the package, the spinster's hair is parted in the center and plastered down. Lavinia is invited to remain for the winter. She could "help," monitor or coach her unrefined niece Catherine to become more social and "join in freely with the young people...enjoy herself" at the evening's party planned by Austin's other sister, Elizabeth Almond (Selena Royle), who is married to husband Jefferson Almond (Ray Collins). Catherine often enjoys her hobby of embroidery, rarely leaving the house and forsaking other social luncheons and engagements, when Lavinia cautions her to be more outgoing: "Don't go off by yourself tonight, will you? Stay with all of us and enjoy the party." Catherine wishes to please her father's wishes, to be composed and enter into conversations, but when she is in company, she feels no one wants to listen to her. Before the party, Dr. Sloper politely congratulates his daughter on her new "sumptuous, opulent" cherry-red gown she acquired for the party: "You look as if you had $80,000 a year." But then he compares her unfavorably to his deceased wife - alleged to have more brilliance and beauty: "Your mother was fair. She dominated the color." At the festive party after an orchestral fanfare, Jefferson makes an announcement to the gathered guests -- the engagement of their beautiful and lovely young daughter Marian Almond (Mona Freeman) to eligible bachelor Arthur Townsend (Paul Lees), "a most wonderful young man." An entirely mediocre and defenseless creature with not a shred of poise. He then recalls his worshipped memory of Catherine's mother, by way of an unfair comparison: "Her mother, who had so much grace and gaiety. This is her child." Elizabeth reminds him of his intolerance and for romanticizing his wife out of proportion: "No child could compete with this image you have of her mother. You've idealized that poor dead woman beyond all human recognition." He retorts: "Only I know what I'd lost when she died and what I got in her place." At the gathering, Lavinia monitors Catherine's every action and tells her to use her fan to keep her hands busy - Catherine waves it nervously. She is surprised when Arthur's cousin, the handsome, dashing and charming bon vivant Morris Townsend (Montgomery Clift) who has just returned from Europe, asks her to dance a waltz. She clumsily jots down his name for the 5th place on her dance card, but then accepts his invitation to dance immediately. She is awkward and embarrassed by her inelegant and graceless dancing style, although he flatters her by blaming himself for their cloddishness. He instructs her: "Don't look at your feet. Look at me," and Catherine is again flattered by his deferential attentiveness - and they even have a second dance together. As they sit next to a gazebo, he tells her that he has decided to remain in New York - undoubtedly on account of her. Catherine apologizes that she must leave the party early with her father and Aunt. He asks that he might call at the Sloper house to see her again, and then kisses her hand as she leaves. Morris: I think of you constantly. Catherine: I'm not good at this kind of conversation. Morris: Neither am I. I'm afraid that is our trouble. I'm not a glib man, Miss Sloper. Catherine: I think you talk very well. Morris: Not when I need it most. Oh, with Mrs. Penniman or in my room at home, I can think of the most delightful things to say. Can you understand that? Morris: But here with you, I sound like a fool. Catherine: I don't think so. He candidly confides in her that she should advise him when he sounds either "high-blown or false." He then appeals to her own insecurities when he reveals: "Take pity on my situation...Miss Sloper, I have fallen in love with you." His entreaties are interrupted by the arrival of Dr. Sloper, who is "delighted" to greet him. After Townsend admires Catherine as "a most attractive young lady," he is invited to stay for sherry and biscuits, and continues to agreeably flatter her in front of her father - and she beams: "Miss Sloper has a great appreciation for music. That is a talent in itself."